BitCoin, Pyramid Schemes and Alternate Currencies. I’ve been on these Internets long enough to have seen my share of pyramid schemes masquerading themselves as something “revolutionary”. Back in the early 2000’s I can remember getting swept up in all sorts of “make money online” things that promised to pay you big bucks if you did surveys, clicked on links and some for just simply browsing the web. I also had a hand in bringing a few of these down, like many users of it did, when the system only did minimal checks on new users making it quite easy to make 1 person look like 200. I still keep a couple trophies of that time (a couple CDs I bought with Beenz) mostly for the sick pleasure I get in knowing that those companies were doomed from the start. Over the years many other forms of alternate currencies came and went as did the venture capital dollars that had been invested in them. I think the last one I ever tried was EmailCash which has managed to survive by not trying to become an alternative currency, preferring to stay in the lucrative world of rewards programs. After I realised the effort I was putting into the schemes was netting me a return of much less than $1/hour I gave up on them completely and spent more time at my real job. The idea of a inventing a currency is a tantalizing one though and the most recent addition to the long list of alternative currencies is becoming a hot topic amongst the tech community. I am of course referring to the BitCoin sensation, a decentralized peer to peer currency that allows users to “mine” BitCoins by acting as part of the payment network. It’s a very interesting idea especially when it adopts many characteristics of the platform its built on, allowing for truly anonymous transactions and a currency that can’t be controlled by any government. However, whilst I love the core idea behind BitCoin, I can’t help but feel this is an extremely elaborate pyramid scheme, and I’ll explain why. 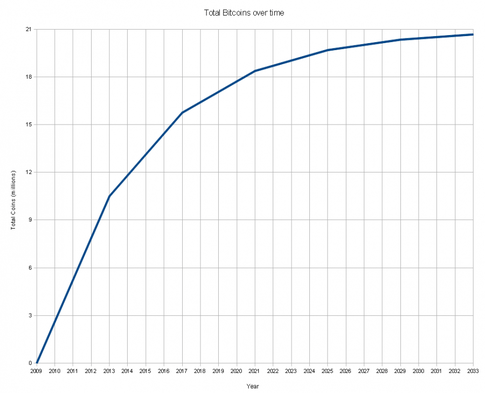 BitCoins have an upper limit on how many can be produced, approximately 21 million if we take the creator’s word for it. BitCoins are almost infinitely divisible however so they can still be used quite extensively once the upper limit on the number has been reached. However the complexity in mining a BitCoin increases considerably over time as they start to become mined out and is accelerated by the number of people participating in the network. Thus the true benefactors of the BitCoin system are those who were in it from the beginning as back then it was relatively easy to generate BitCoins and thus they could amass quite a large amount of wealth in a short amount of time. Like any alternative currency however BitCoins are completely useless if you can’t exchange them with other people for goods and services. It is then in the best interests of the early adopters to get other people to accept them as a legitimate form of currency. This means getting more people on the BitCoin network which, strictly speaking, doesn’t have a traditional referral system in place so it usually passes the pyramid scheme sniff test of most people. Still every additional member that joins and participates in the network is generating value for all of those that came before them, thus it is better for someone to “get in now” before the gold rush hits and the potential wealth disappears. Also BitCoin, whilst being quite resilient to most exploitations, is still a computer system that can be manipulated. Most recently it came to light that one of the pools, DeepBit, managed to reach the critical 50% threshold of computing power that would make exploitation possible. Whilst it quickly sank back down in order to avoid such a scenario such a situation and no exploits were detected such a situation had only been “theoretically” possible until it actually happened. If BitCoin garners mass adoption you can bet there will be bot herds targeting the network in an attempt to exploit it. Whether they will be successful or not remains to be seen. Given the rather checkered history that alternative currencies have I’ve been casting a sceptical eye over anyone who thinks that they’ve got this problem space solved, and BitCoin is no exception. Sure I was little excited about being able to generate some cash with spare CPU cycles but that feeling that this whole thing is just an elaborate pyramid scheme was too hard to shake and I’ve left it by the wayside. As a payment system it might not be a bad idea but the whole idea behind mining coins just means you’re paying to make the early adopters rich and that’s the main reason I take issue with the BitCoin system. It’s really hard to trust something when its structure too closely follows that of the ye olde pyramid scheme.